JOHN�S ISLAND, SC -- Exclusive. Acclaimed. Elite. Preeminent. 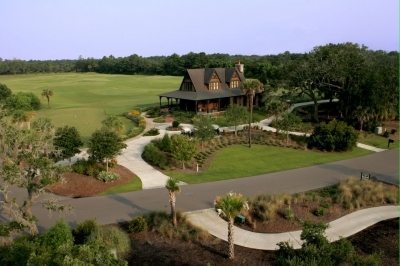 Lodge - The golf lodge, which now houses the clubhouse, pro shop, bar, and restaurant, will soon be replaced in December 2007 by a 13,000 square foot clubhouse, overlooking the Kiawah River, and nestled between the 9th and 18th greens. 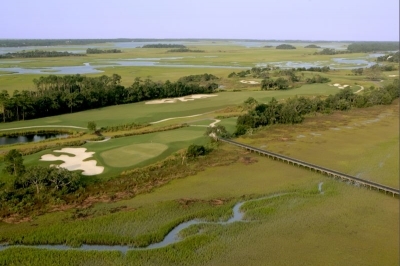 Pick one of these prior four words to describe The Golf Club at Briar�s Creek, located on Johns Island, South Carolina, and, guess what? You�d be right. And, if you are lucky enough to play a round of golf there, I bet you�ll come up with several different superlative adjectives of your own to describe this wonderful �new� private golf course. 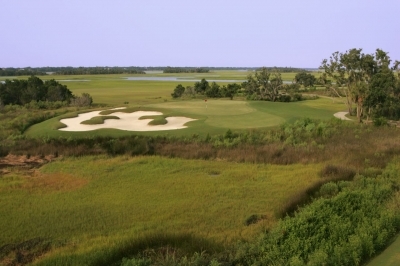 Briar�s Creek is located just twenty-five minutes from downtown Charleston, and ten minutes from Kiawah Island. As noted on the Briar�s creek website, Charleston and the South Carolina Low country have been heralded in more publications than can be counted. Praises have been sung for its historic, artistic and cultural preservation; its white sand beaches and abundant sports, such as boating, fishing, equestrian; and as the south�s Mecca for world-class dining and entertainment. 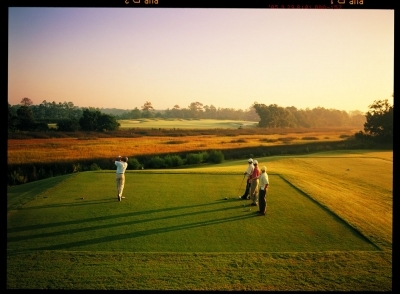 While not exactly new, Briar�s Creek opened in 2001, and it didn�t take long for the rave reviews to come in. 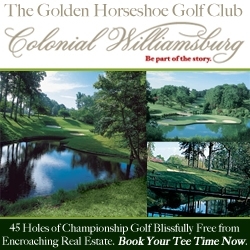 Golf Digest, in January 2003, named Briar�s Creek �Best New Private Course� in America. Of the top 45 courses built since 1959, Golf Magazine has named it #10. Not impressed yet? 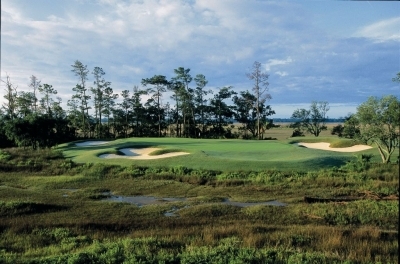 Fine, how�s this: Briar�s Creek is currently ranked by Golf Magazine as the 64th (out of 100) Top Course in the United States, and it is currently ranked #96 (also out of 100) by Golf Digest on its list of America�s Top 100 Greatest Courses. This view of the 9th green embodies the marvelous surroundings which are prevalent at Briar's Creek. Oh yes, the course itself. 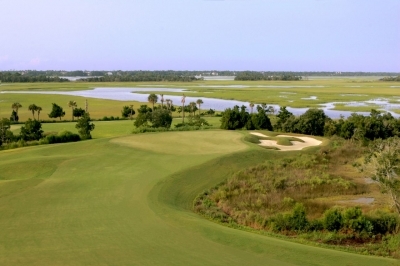 Briar�s Creek is situated on a spectacular parcel of land, once used, like much of Johns Island, for agriculture. Tomatoes were the primary crop. For the technical minded, the greens are Tiff-Eagle, a Bermuda ultra-dwarf. The fairways and tees are 419 Bermuda. Mr. Rees Jones, also known as �The Open Doctor,� is the course architect. You may have heard of him. With co-designer Greg Muirhead, Jones completed a major redesign for the Black course at Bethpage State Park, home of the 2002 U.S. Open. Also, in preparation for the 1988 U.S. Open, Mr. Jones restored The County Club in Brookline, Massachusetts, site of the 1988 U.S. Open and 1999 Ryder Cup. The green at the finishing hole. Getting here involves hitting a least two, and, more likely three quality shots. So, yes Briar�s Creek has indisputably earned all of its accolades. Arial view of the 17th hole. In a word, daunting. The Par 3 15th hole, the most eye appealing Par 3 at Briar's Creek. My car door had barely closed when I was greeted by one of the assistant golf professionals. I asked him if they were busy this morning, assuming so based on the great weather that was ruling the day. He said, �I think we have 6 players out on the course.� I don�t know about you, but my experience tells me that at 9am on a beautiful Saturday morning, there may be 50 to 60 players making their way around any given golf course. While hitting range balls (Titleist practice balls -- no stripes here) on the expansive grass practice range, one backward glance allows you to see one or two assistant golf professionals watching your moves. Hit a 9 iron a few times, then put it back in your bag to get a six iron out? No problem, when next back to your bag, your 9 iron is cleaner than if Steve Williams got a hold of one of Tiger Wood�s irons. Don�t know about you, but this was way cool! Good natured, but right on point, golf tips are readily offered by the professionals as well. According to Mr. Bright, Briar�s Creek has �no tee times,� and allows no unaccompanied guests for its current membership measuring 150 (most of whom are not full time residents). A maximum number of 300 members is planned. The tee at the 10th hole, a beautiful dogleg right. In my opinion, members enjoy a true private golf retreat; low density golf at its finest. Consult the club for membership information.